Our ThermoFormat software is designed mainly for batch administration of recorded thermograms. If you need to change the color palette, emissivity, or temperature scale in all the recorded thermograms then the ThermoFormat will saves you a lot of time as it can perform all of these functions. The ability to export recorded thermograms with EXIF metadata to create photogrammetry and 3D models can also be accomplished using this software. 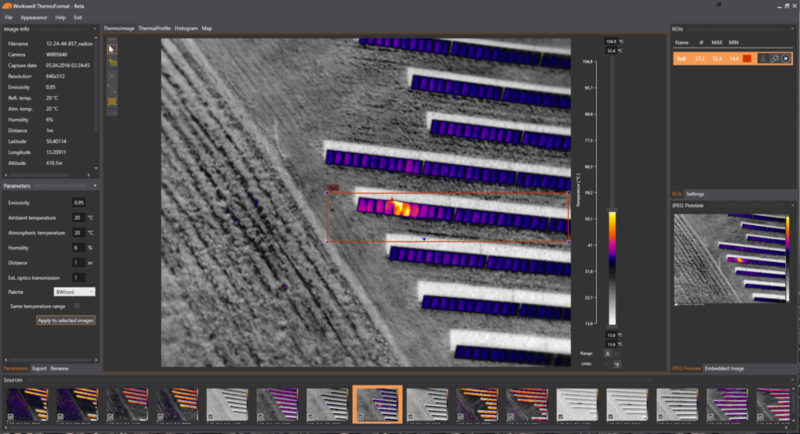 Workswells ThermoFormat is the most frequently used program for mass editing of thermograms produced by the Workswell WIRIS system – thermovision system for drones. It is mainly used for thermography and creation of 3D models in cooperation with Pix4D software. See the data list for further information on all functionalities. Setting the measuring parameters for image and radiometric video, such as emissivity, reflected apparent temperature, and atmospheric parameters. Editing of radiometric images (thermograms), adding measuring functions into the image, changing the palette, changing the temperature range, activation / deactivation of alarm, etc. Insertion of measuring functions: measuring of temperature in the point, minimum and maximum in the area, polygonal and triangle area, temperature profile and other functions. Display of GPS coordinates on the map and in the case of radiometric video, the display of the GPS position of individual images and the whole trajectory. Creation of PDF report on measurements from acquired images. Export of images from digital camera (Workswell WIRIS). Export of radiometric data into Microsoft Excel (CSV file). Display of graph with the development of temperature at the time in the stated point (for radiometric sequence). Export of radiometric sequence into AVI video format.